Trillium (Trillium ovatum) – Encourages effortlessly integrating your personal energy into the Matrix of the Universal All-That-Is. Increases your experience of connection to and communication through this Divine Grid of Life. I AM one with the Divine Matrix of Life. 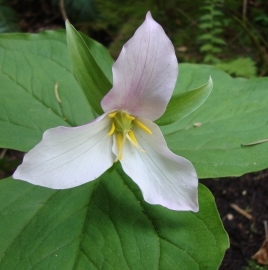 Western Trillium, a member of the lily family, grows in moist open forests. Ants gather the seed for its oil rich appendage. They take the seeds to their nests, eat the oil then discard the seed. Trillium and several other low light forest plants have developed this method of dispersing their seed. Trillium’s name, which in Latin means “in 3’s,” refers to the 3 leaves, 3 petals of the blossom, 3 sepals and 3 stigmas (tip of the female organ where the pollen lands). Use Trillium Flower Essence when you want to be more connected to all of Life, to feel the Oneness of Everything. If you sense/feel an area of your body that feels disconnected, less energized than other areas, there may be a broken connection between that spot and the Divine Matrix. This disconnection could be from an injury, surgery, physical or emotional trauma, energetic intrusions in your energy fields, the overload of daily life or rapid spiritual expansion. Symptom could include joint, muscle or nerve pain; muscle weakness; headaches; digestive problems and much more. Trillium flower essence reorganizes your personal energy grid so points/areas of your body that are disconnected can reconnect and learn to maintain a connection to the Divine Matrix. It increases your experience of being connected to and receiving energetic communication through the Grid of the Universal All-That-Is. Trillium flower essence is also effective for use during meditation, channeling or any time you desire to feel more connected to The Whole. It carries the signature of sacred geometry and sacred numbers as they influence the holographic matrix of ALL-That-Is. The trillium plant grows in 3’s as noted above. When petals, leaves, sepals and stigmas are added they give the numbers of 3, 6, 9, 12. Trillium flower essence is compatible with the current human energy grid and torus of energy around the body. It is time coded to automatically upgrade with future shifts. Trillium Flower Essence was made by the no-pick method of working directly with the plant spirit. While the essence was being made, a matrix of crystals - amber, danburite, drusy quartz, icosahedron cut quartz, Jeffrey quartz, quartz points and Tibetan black quartz- were placed among the plants with the mother bottles. The sun acts as a transformer to step down spiritual energies from higher dimensions. While the essence was being made, Amber acted as a lens to receive and focus sunlight for this purpose. Danburite increases communication with angels and other high frequency beings. It facilitates embodying resonance with the Divine Heart, so you may be of service by bringing this energy to the world. Drusy quartz crystals help to energize and stabilize your subtle bodies. Icosahedron cut quartz has 20 (5X4) equilateral sides. It is a bridge between the 5th Dimension - the entry into the unified Spiritual realms - and the 4 cardinal directions (N, S, E, W) on Earth. Jeffrey quartz provides strong amplification properties and long distance healing abilities. Quartz points are used for healing, meditation, expanding the mind to touch the spirit world, and amplifying white Light. Tibetan black quartz resonates through the crown, 3rd eye and heart chakras, helping you to embody your Higher Self and to communicate with the higher frequency planes of consciousness. It clears debris from your energy fields, creates a bubble of Light around your body, and moves energy blockages allowing for Light to bath your body down to the cellular level. The action of the crystals influences the way this essence grounds into your body/mind. While this essence was being made eagle feather, the sound of rattle, and spirit song coming through Diana’s voice were infused into the essence.